Wow, when did Roadrunner Records become so cool? They used to be a safe haven for post-grunge and nu-metal acts (and really, they still are). Now, not only do they have KISS, Megadeth, Sammy Hagar, Dream Theater, Airbourne, Slash, Lynyrd Skynyrd and Rob Zombie signed to various deals but Ratt as well! I had been looking forward to this album for a long time. In fact, it’s been one of my most anticipated releases for 2010. There are times where you can predict an album’s quality before it comes out. A time when you have a “feeling” before hearing the first note. My “feeling” was right about Chickenfoot, wrong about Slash but I was right once again for Ratt. I was feelin’ good vibes, man, over the idea of some new Ratt music. For fans of Ratt’s early albums, Infestation will not let you down. It is a conscious effort to relive the glory days of Out of the Cellar and Invasion of Your Privacy. 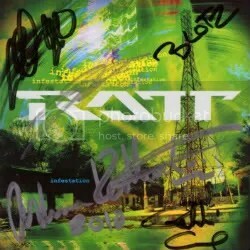 Personally, I enjoy all of Ratt’s albums (well, I haven’t bothered with their 1999 self-title due to so many poor reviews I’ve read), even the glossed up sounds of Detonator, which I think is underrated. But Infestation leaves the polish at home and gets back to filthy sleazy Ratt ‘n’ roll. Despite whatever live concert reports may say, I think Stephen Pearcy sounds just as good as ever on tape (of course, technology has improved too!). The only thing that’s lacking from band performance is there just doesn’t seem to be enough spotlight shining on Warren DeMartini. Maybe I’m crazy but I just don’t think he had a strong enough presence on the album. That’s a minor quibble though. The album starts off great with a pair of classic sounding Ratt songs: “Eat Me Up Alive” and “Best of Me”. “Best of Me” is my favorite song on the album and it’s the lead single. New Ratt pack member Carlos Cavazo (ex-Quiet Riot) actually wrote the majority of that song so he’s already off to fitting in with Ratt because it sounds exactly like old school Ratt. The rest of the album keeps up with the band’s mid ’80s heyday delivering one dirty rocker after another. The album’s sole slow moment is “Take Me Home”, which is definitely the weakest track and possibly the weakest Ratt song I’ve heard to date. It sounds like the album’s lone effort to sound modern. I wouldn’t be surprised to see this as the next single, if they release a second single. I love the string arrangement but it’s the first half of the song that ruins the whole track for me. Overall, this is a more than worthy addition to the Ratt catalog. I’m not sure where I’d rank it yet though. It’s still too fresh and I love their previous efforts so much but this is an album definitely worth checking out for Ratt fans. It will not disappoint. I ordered my copy from Roadrunner’s website a few weeks before the release. With the pre-order you immediately got a digital download copy of “Eat Me Up Alive” and the album arrived with an extra CD booklet signed by the band! How cool is that? Ah, now this is more like it! 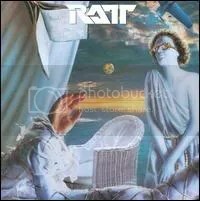 This would be the final album from the glory days of Ratt and it definitely delivered a more Rattier sound than what Reach for the Sky did, but truthfully, this is still a slick album, “Givin’ Yourself Away” is Exhibit A of that. The band traded one slick producer for another by parting ways with Beau Hill and hooking up with Desmond Child, who also co-wrote ever song with the band and even brought along Jon Bon Jovi for backing vocals. Still, songs like “Shame Shame Shame and “Lovin’ You’s a Dirty Job’ are classic Ratt and this is definitely a must-have release for Ratt fans. Unfortunately, the album didn’t sell as well as their previous releases, “only” going Gold. This album was the end of an era due to internal band conflicts and a change in the musical climate. This was the final album from Ratt’s original run that I picked up. I ended up ordering it online years ago during a CD splurge, and the main reason it took me so long to track it down is because of the poor reviews the album has received. Those reviews were pretty right on because Reach for the Sky is by far the weakest Ratt effort… Well, until their 1999 self-titled “comeback” album that is. Here, we see the band continues to opt for an even more commercial poppy sound that was started with Dancing Undercover. The edge is gone on this album and Ratt as ventures into by-the-numbers pop metal, which didn’t really make sense because Dancing Undercover didn’t sell as well as the first two albums, so why bother to continue going in the same direction? The band’s third release in three years, and fourth in four years if you wanna count 1983’s Ratt EP. By this point, the band was going sounding slicker and more polished, to keep up with the new wave of pop metal bands, and still had Beau Hill at the helm as producer. But it’s still another solid release of catchy pop metal though the guitars don’t get much of a chance to shine that I’ll pull out every now and then. Even so, “Dance” and “Slip of the Lip” are pop metal gems. Invasion of Your Privacy = Out of the Cellar II, though it’s not *as* consistent as Out of the Cellar was. 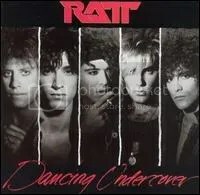 Even though the album played it safe, they came up with some of Ratt’s best songs: “Lay It Down” (another signature song alongside “Round and Round”) and “You’re In Love”. 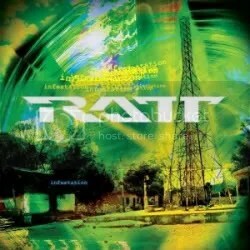 Ratt is one of my absolute favorite hair/pop metal bands and this album is a great example of why. Stephen Pearcy’s voice gets knocked a lot, but I think it was and still is a great fit for a pop metal band like Ratt and the guitar work from DeMartini and Crosby cannot be denied. 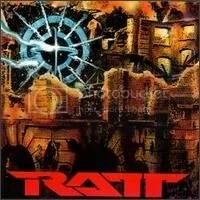 This is probably Ratt’s best release, IMO, even though I like their other ones a lot too. The one-two punch of “Lack of Communication” and “Back for More” (my favorite Ratt song) really put this album over the top for me. 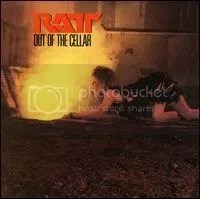 Ratt rode the line between sounding sleazy and slick with ease and did a great job of it with Beau Hill producing (as he would do for a total of four Ratt albums). “Round and Round” is the band’s best known song and it’s still good enough to be an album highlight, but by this point, I’m sick of it. It’s still all over radio, 80s rock compilations and VH1 Classic and has become one of the signature songs of the genre, but ENOUGH! I’ve heard that song enough to last me the rest of my life.